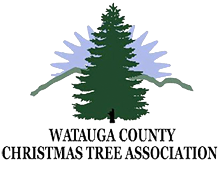 Two-thirds of the Watauga County Christmas Tree Association membership grows Fraser Fir Christmas trees for the Wholesale Christmas tree market. WCCTA wholesale growers function as an alliance of local farmers who support and cooperate with one another to meet the needs of large and small wholesale tree buyers. Wholesale Christmas trees are shipped all over the country to the Northeast, across the Southeast, Midwest, and beyond. Fraser Fir Christmas trees are also shipped into Mexico, the Caribbean, and across the Atlantic into Europe. Wholesale Christmas tree farmers utilize USDA grading standards and offer premium grade trees, as well as #1 and #2 Christmas trees, which together supply a variety of markets across the country. Wholesalers work with civic clubs, churches, tree lot operators, farmers markets, and large chain stores to bring REAL Fraser Fir trees to consumers who demand an exceptional quality Christmas tree. For up-to-date listing of Wholesale Christmas tree farms in Watauga County, North Carolina, or for more information, please contact Susanne at 828-264-3061 or E-Mail Us.